Raw natural gas consists primarily of methane (CH4), and varying amounts of higher molecular weight hydrocarbons and other contaminants. Natural gas containing acidic contaminants (H2S and/or CO2) is commonly referred as sour gas. H2S is a highly toxic gas which can be fatal to humans at higher concentration. Acid contaminants can also create problems such as increased corrosion in gas pipelines. To avoid these health, safety and operational problems, acidic contaminants need to be removed to produce a ‘sweet’ gas stream. The sweet gas should have an H2S content of less than 4 ppmv. The process used to remove these species is commonly known as natural gas sweetening. The most common sweetening process utilizes an amine solution to absorb the H2S and CO2. According to the GPSA Engineering Databook (13th edition) , the amine circulation rate can be determined based on the moles of acid gas that need to be removed, as well as the ‘acid gas loading’ in the rich amine solution. Hence it is very important to understand the acid gas loading parameter for effective and efficient operations. What is acid gas loading? As per GPSA Engineering Databook , acid gas loading is the amount of acid gas, on a molar basis, that will be picked up by a solvent. This is commonly expressed in units of mole of acid gas / mole amine. MEA: The acid gas loading is traditionally limited to 0.3-0.35 mole acid gas/mole MEA. DEA: The acid gas loading with DEA is typically 0.35-0.82 mole acid gas/mole DEA. MEA: The typical acid gas loading is 0.35 moles of acid gas/mole of MEA. DEA: The typical acid gas loading is 0.5-0.7 mole acid gas/mole DEA. MDEA: The typical acid gas loading is 0.4 mole acid gas/mole MDEA. It should be noted that the above typical loading numbers consider typical assumptions/conditions like inlet sour gas H2S content around 1%-4% etc. However, it is not uncommon to operate an amine plant with significantly lower loadings (for example if the inlet H2S is 1000 ppmv, or 0.1%). The maximum attainable pure component loading is limited by the equilibrium solubility of H2S and CO2 at the absorber bottoms conditions . 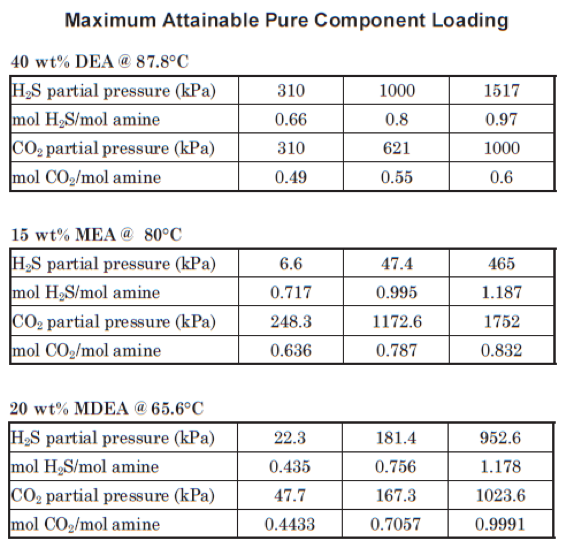 Figure 1 taken from the GPSA Engineering Data Book  (summarized from a GPA Research Report) shows the maximum attainable loading of various amines. As can be seen from the figure, one of the major factors affecting the amine loading is the partial pressure of the acid gas component. From an operational point of view, there is no limit on high contactor pressure as far as the process is concerned. For the same inlet acid gas mole fraction, the higher the contactor pressure, the higher the acid gas partial pressure, hence better acid gas loading in amine solution. Another major factor affecting the amine loading is the contactor temperature. Figure 2 taken from Gas Purification  shows the effect of temperature on the solubility of H2S in MDEA. 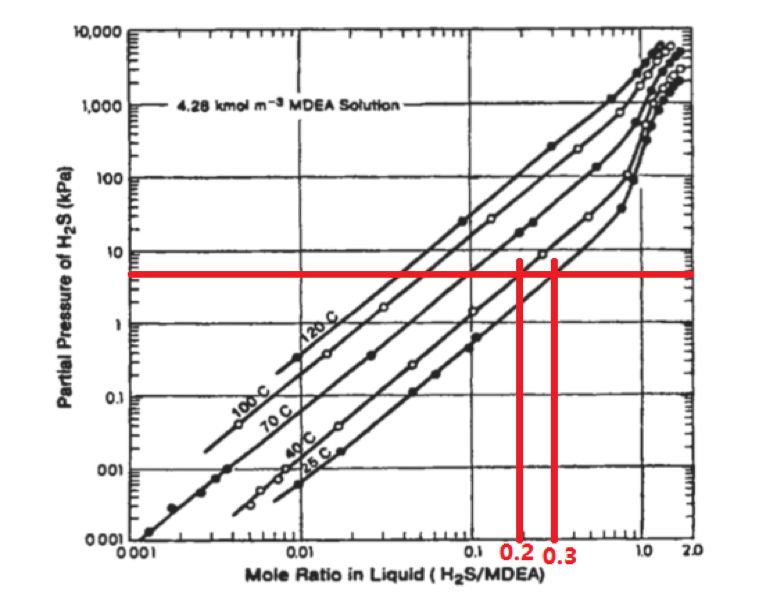 As can be observed from Figure 2, for the same H2S partial pressure, the equilibrium H2S solubility is 0.3 mole H2S / mole MDEA at 25 C, and 0.2 mole H2S / mole MDEA at 40 C. A low operating temperature is preferable for acid gas absorption in the contactor column. Should the feed gas be at high temperature, an inlet cooler (using air or water) would be required. Acid gas loading in amine solutions is an important factor in operating a gas sweetening unit. There are many references outlining typical amine loading values for various amines. However, it should be noted that it is common that many sweetening unit are operating below the typical loading numbers. Two major factors affecting the amine loading are: 1) acid gas component partial pressure, and 2) contactor temperature. In actual operations, each of the amine units should be assessed individually to determine the proper acid gas loading for efficient operations. Addington, Luke, and Chris Ness. "An evaluation of general “Rules of Thumb” in amine sweetening unit design and operation." Bryan Research and Engineering (2009). Kohl, Arthur L., and Richard Nielsen. Gas purification. Gulf Professional Publishing, 1997.